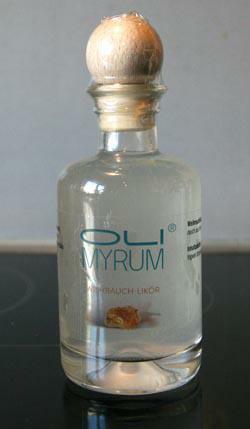 Olimyrum® Frankincense Liqueur is health tonic containing frankincense and alcohol. This frankincense liqueur is a new flavor enrichment of the liqueur palette. The combination with ginger gives the frankincense liqueur a slightly bitter sharpness. This is a drink for frankincense lovers who want to enjoy it as a liqueur. It offers a taste experience without cloying sweetness and with the specific aromas of high-quality frankincense and ginger. The frankincense extract contained within was gently extracted from the Arabian frankincense Boswellia sacra (origin Oman) with many valuable ingredients. It is estragole-free * and free from chemical-synthetic fragrances, colors and preservatives. * Estragole is a natural aromatic substance found in frankincense and other plants, which the Federal Institute for Risk Assessment (Bundesinstitut für Risikobewertung) evaluates as carcinogenic and mutagenic and whose content is to be kept as low as possible in foodstuffs. The Olimyrum® Frankincense products are thoroughly examined and the estragole content is below the detection limit. Wir bieten Ihnen im Bundle drei Medien zur Ausstellung "Religiöse Toleranz  der Islam im Sultanat Oman" zum günstigen Preis an.